The San Francisco Chronicle is a newspaper serving the San Francisco Bay Area. The SF Chronicle was the most popular newspaper on the West Coast by 1880. Like many newspapers, the San Francisco Chronicle experienced a large drop in readership in the 21st Century. Increase the readership of the San Francisco Chronicle and making the San Francisco Chronicle relevant once again through design. A mobile application for the San Francisco Chronicle that provides customized and summarized content in a delightful, simple interface. I interviewed 10 stakeholders, age 20- 70, to get their feedback on the current SF Chronicle and learn about their news consumption habits. I prepared and distributed a survey to 37 participants to collect data on where users are consuming the news, current view of SF Chronicle, how they share and paywalls. People don’t have one place to go for all their news needs, they pick and choose depending on the need. Users are unwilling to pay for content they can get elsewhere, regardless of source or quality. 1. Service only the Bay Area in local categories like sports, neighborhood news, recreation, eats, debates, etc. 2. Be the content creator and summarizer. Few sources have the position of providing authentic content in a conscise way for the busy, tech savvy user. In the vast space of news apps, site, social media users don’t have the time, energy or inclination to find the content they need. Currently, there is no source for relevant, customized, bite-sized San Francisco Bay Area news. We used an empathy map to better understand our users and develop a more intensive profile. Through mapping out which features were necessary, nice to have, and most impactful, I sifted out the MVP. Users can scroll down to their favorite topic, then swipe left to see more articles under the same topic. The user can share directly through the article. 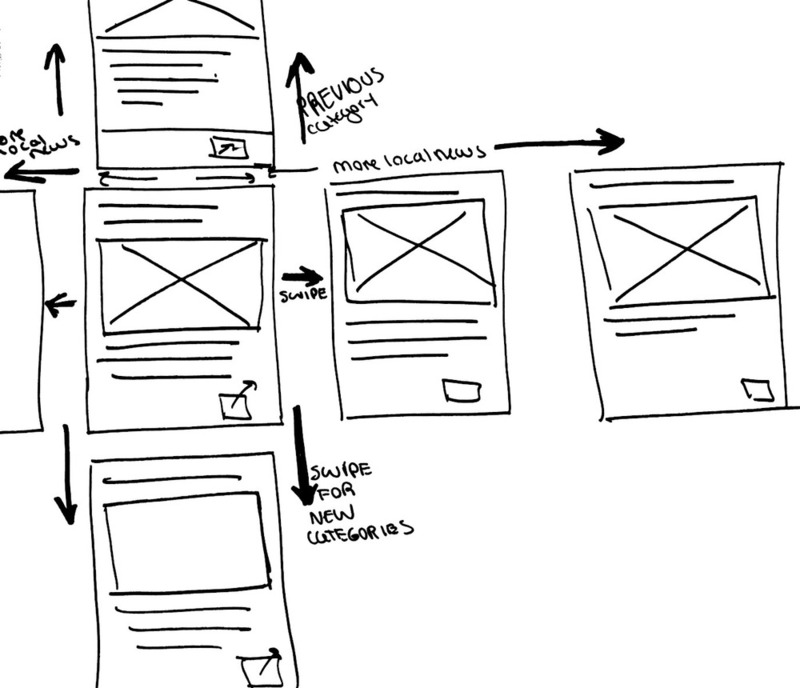 I began sketching based on the sitemap and our design direction. I wanted to try a navigation that scrolled both up and down and right to left to view more relevant content. Users found the gesture based interface very intutive from the start. However, they wanted to know more about the interactions they could make on each article snapshot. Additionally, I realized a quick onboarding would be an effective way to set the stage for the app and ease adoption. The “SF Brief” Is a news application run by the San Francisco Chronicle. It provides users the power to handpick the topics they see on their daily feed, and a brief summary of each article. Readers who want to know more are driven to read the full article on the San Francisco Chronicle’s site. The business goals of increasing readership and relevancy are met by providing a unique, fun, relevant news solution and still driving readers to the SF Chronicle.